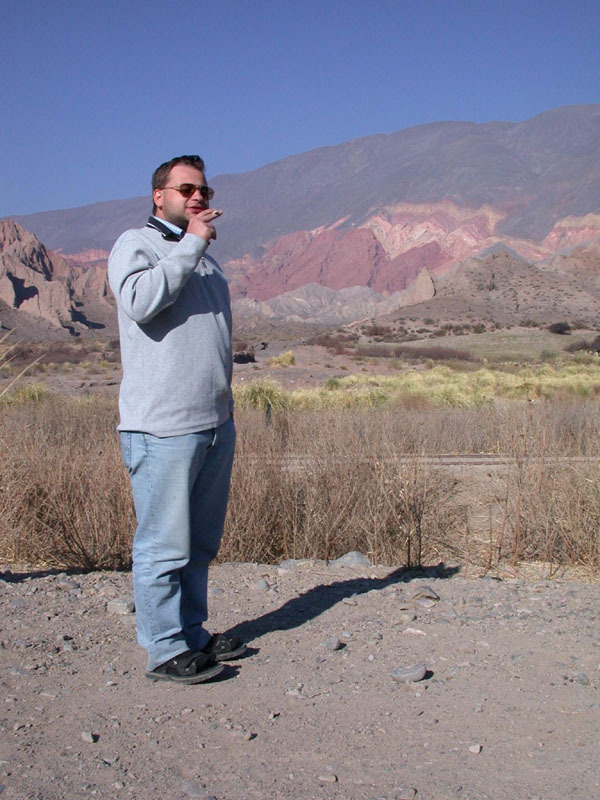 On September the 15th we set off from Salta for the first trip, which we organized by means of local traveling agency. 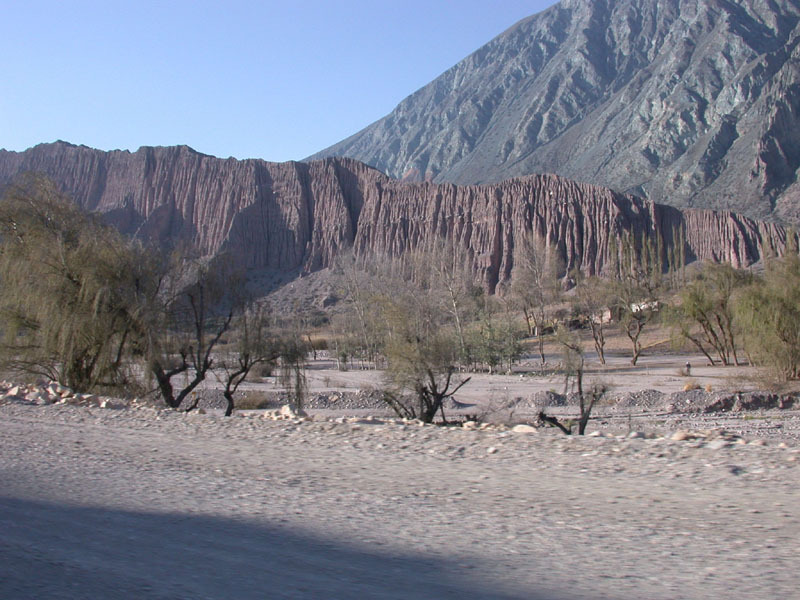 The way ran along the river Toro valley into the Andes interior. 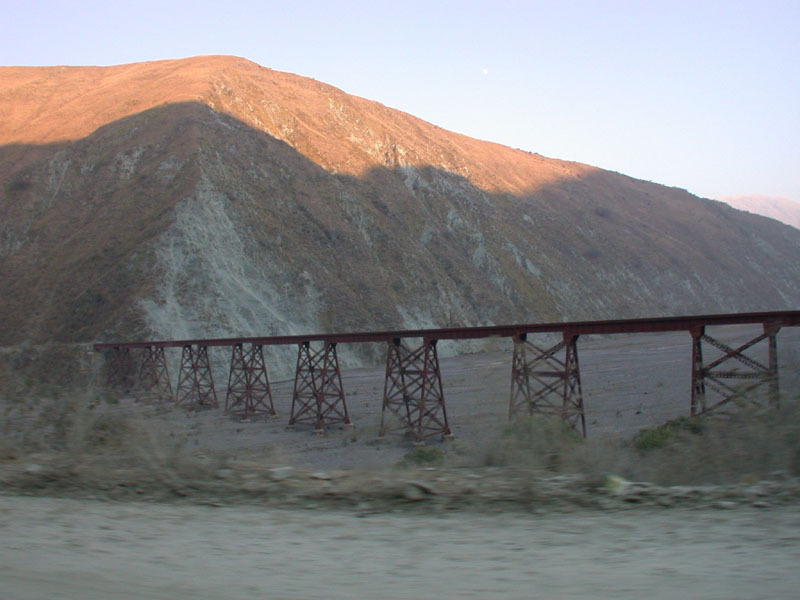 The first part of the way tracked the well-known Train to the Clouds (El Tren de las Nubes). 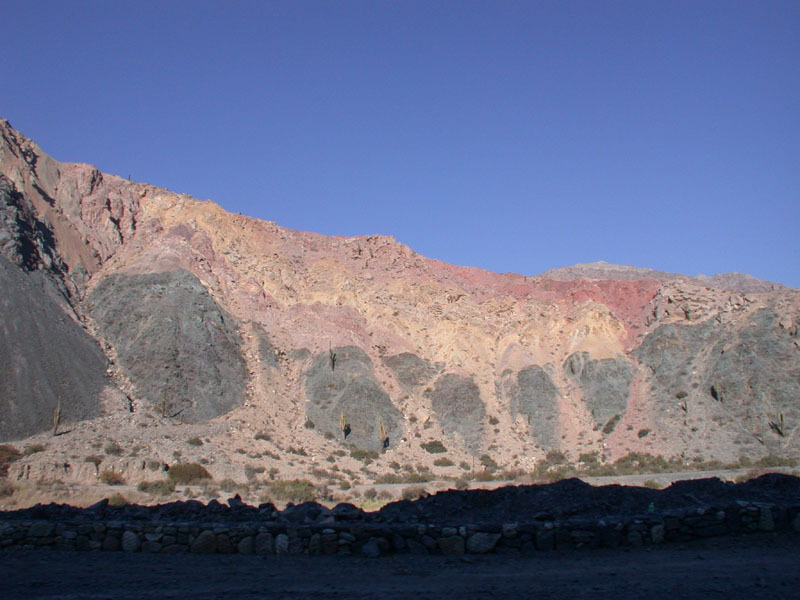 The mountains were full of green and red color caused by the copper and iron presence. First longer stop was in Santa Rosa, a village with a small museum and ruins of Indian village from the sixth century nearby. 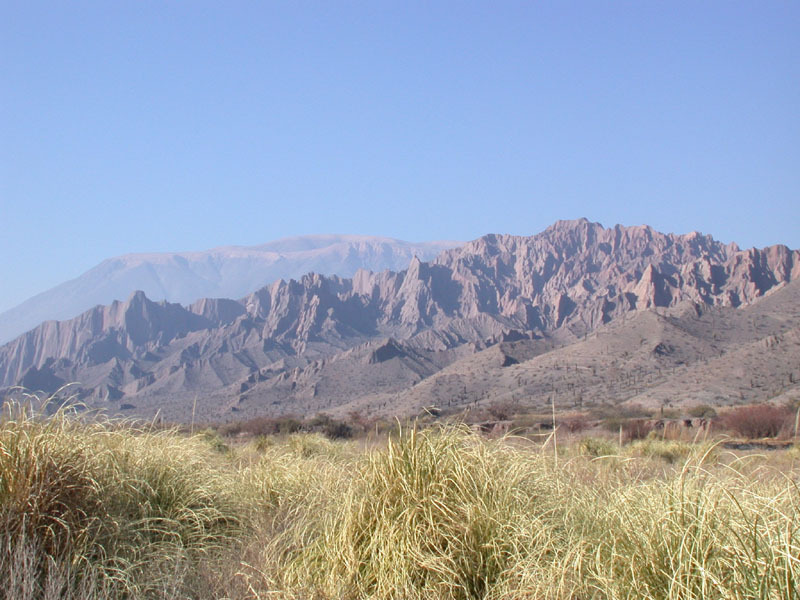 It is estimated that there lived about two thousand people in this area. 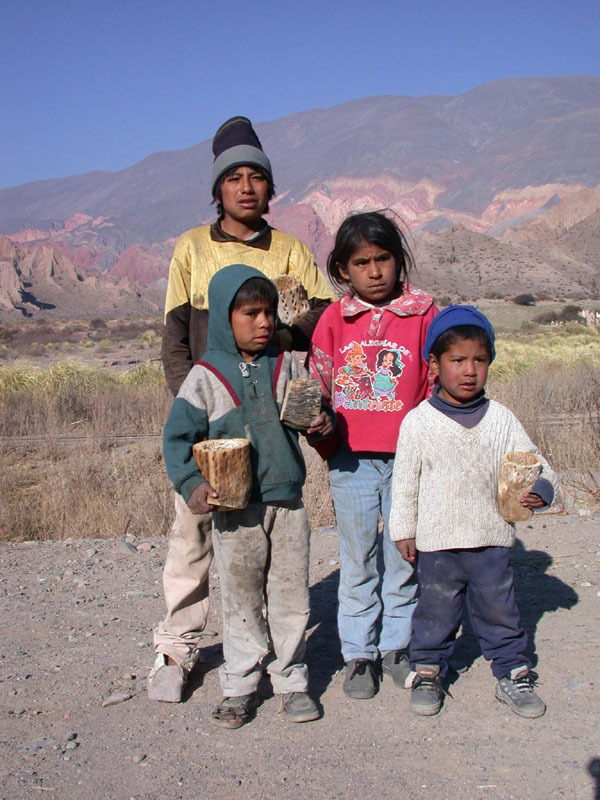 Our way continued to the splendid town San Antonio de los Cobres. We had lunch here and watched lamas. From here we had moved high to the large saltery called Salina Grande. 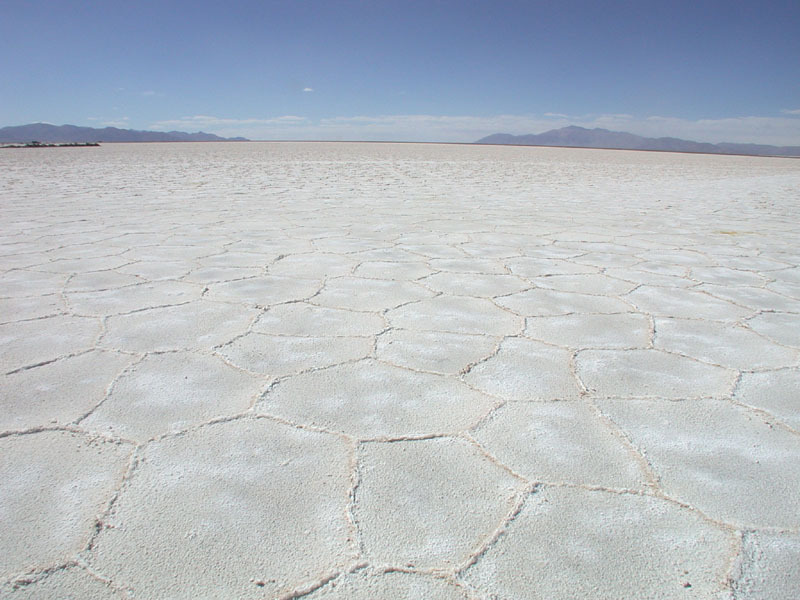 The length of the salt plain is 98 km. 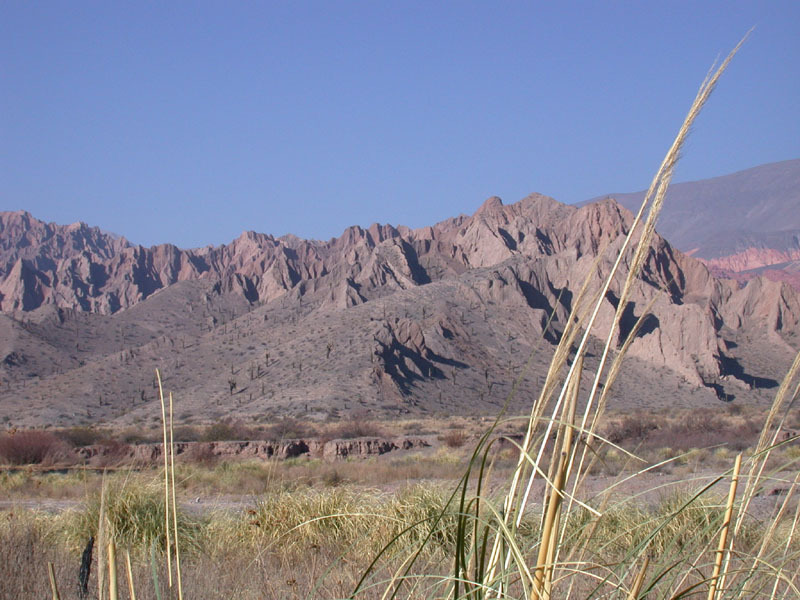 The salt has an oceanic origin from the period of Andes folding. Nowadays it is washed out after big rains. 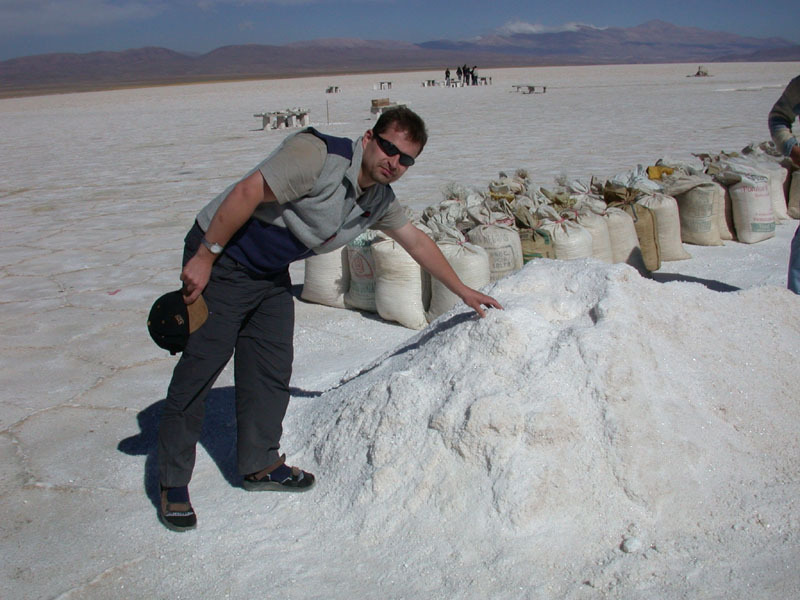 The salt depth is about 3 meters, it is a mixture with sand. The salt is extracted here nowadays. The highest point of our way was 4 170 above the sea level. 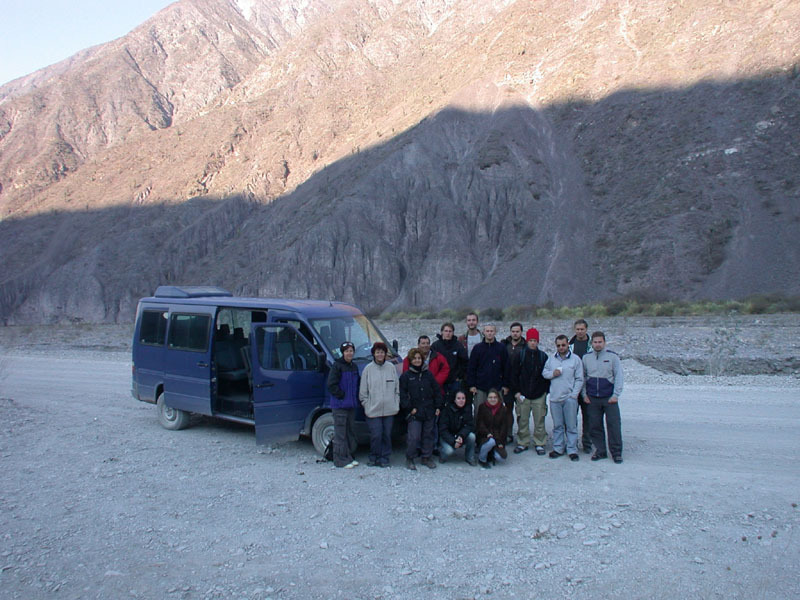 After reaching this point we sloped down to the Purmamarca town (in native language "Purmamarca" means Hidden Valley). 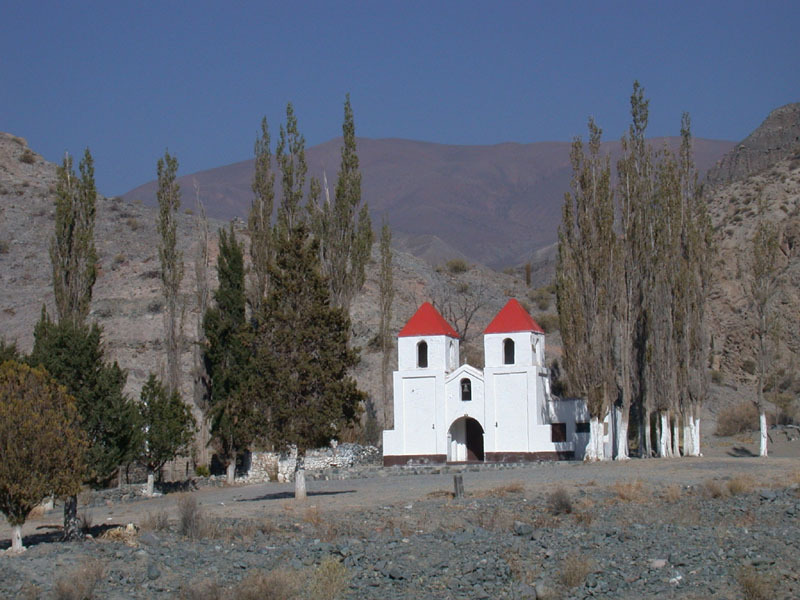 There is a pictorial church in the town and 1 000 years old tree. All the town is urban protected and only ground floor houses can be built here. 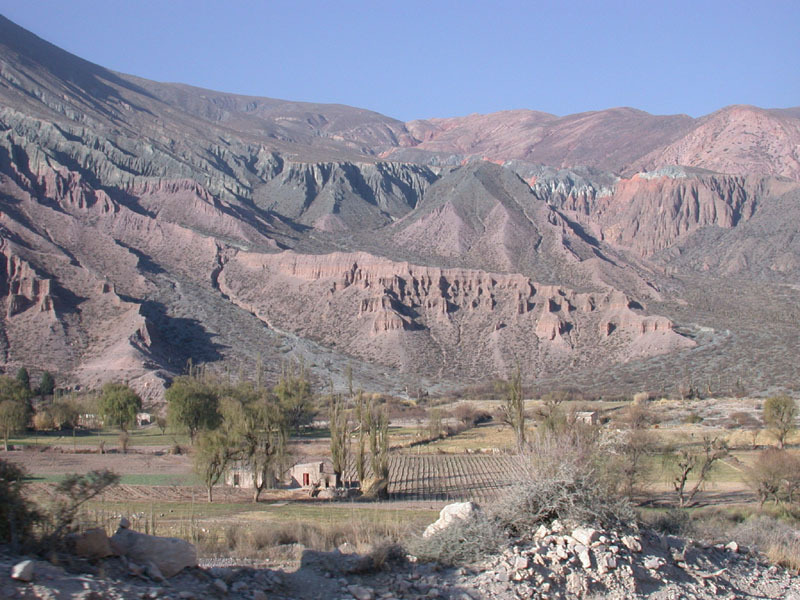 From Purmamarca we returned to Salta in the evening. The van crew. The way begins along the Train to the Clouds (El Tren de las Nubes) track. 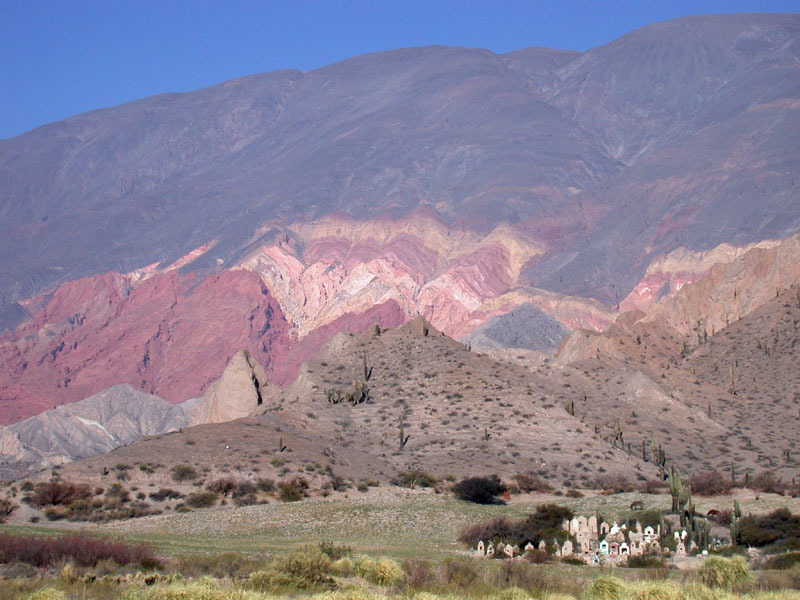 The green color of the mountains is caused by the copper compounds. 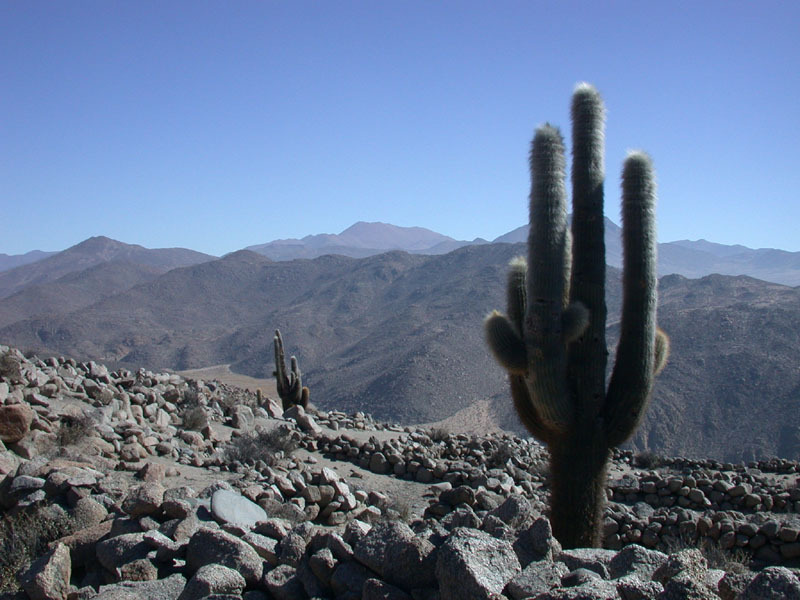 A glance to the ragged Andes. Indian natives. Jacob tries to smoke the coke leaves. 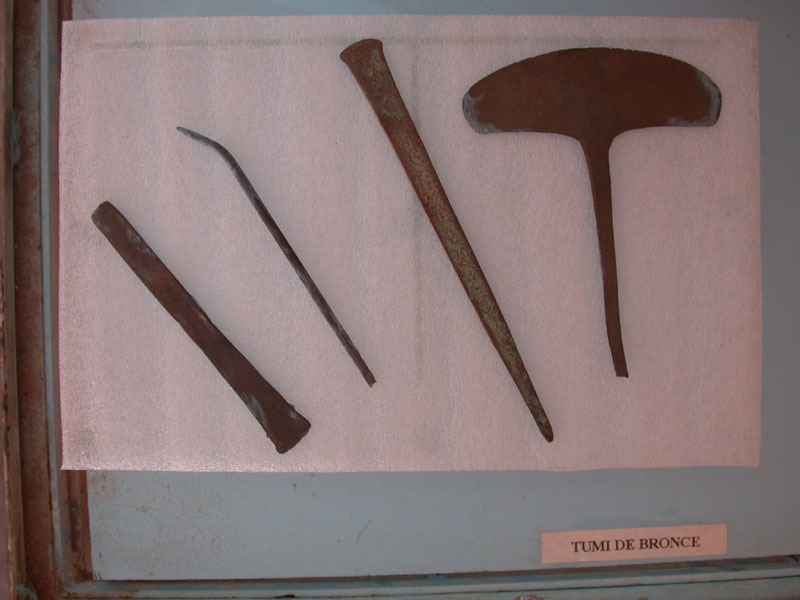 The red color is caused by the iron compounds, the green one by the copper compounds. 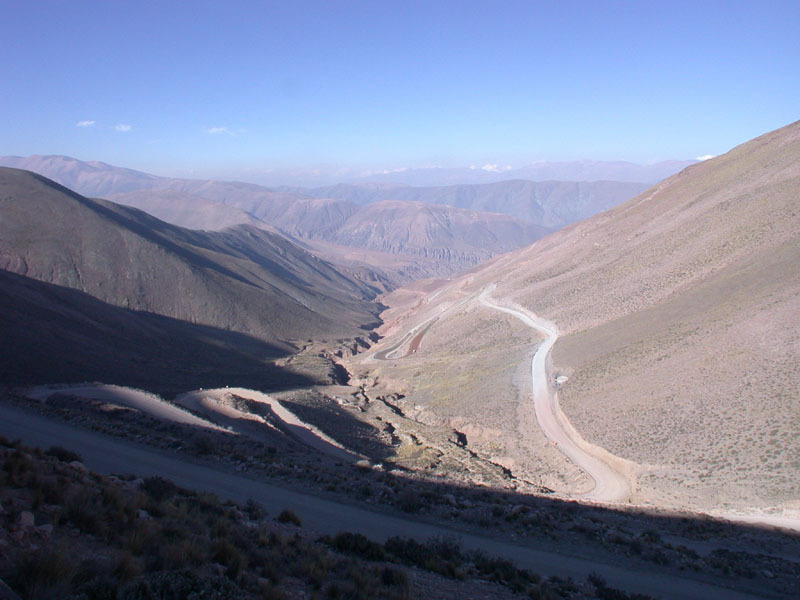 Another charming view of the Andes. A church on the way. Santa Rosa - museum 3 200 meters above the sea level. 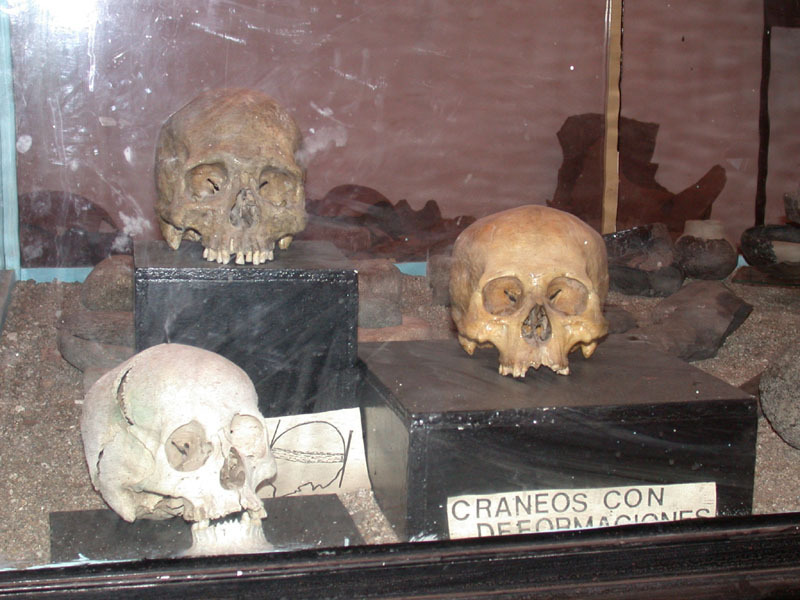 Santa Rosa - museum, a comparison of the skull of man in various stages of the evolution. 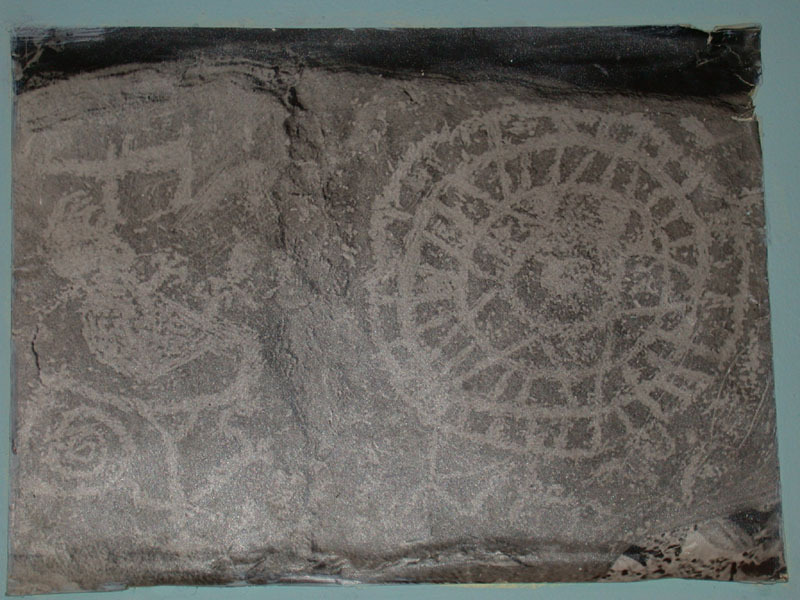 Santa Rosa - museum, stone paintings of the Indians. 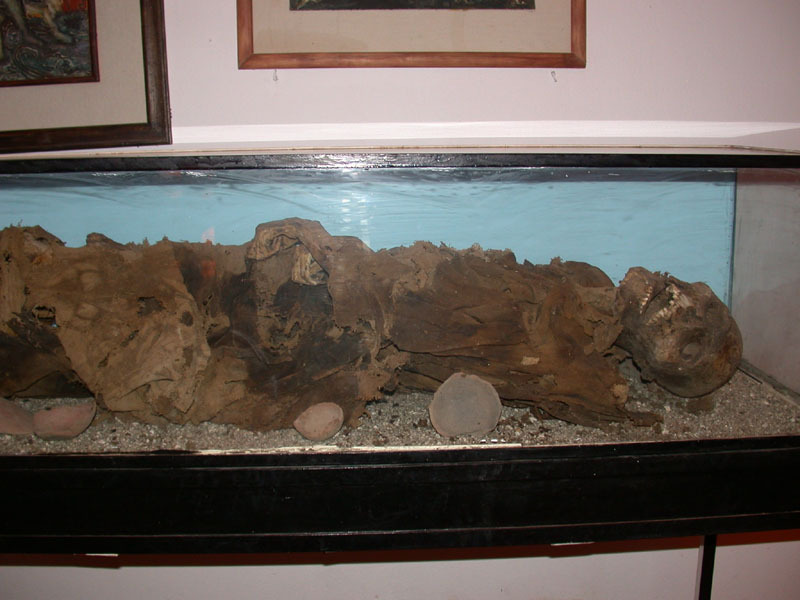 Santa Rosa - museum, mummy. Santa Rosa - cemetery. 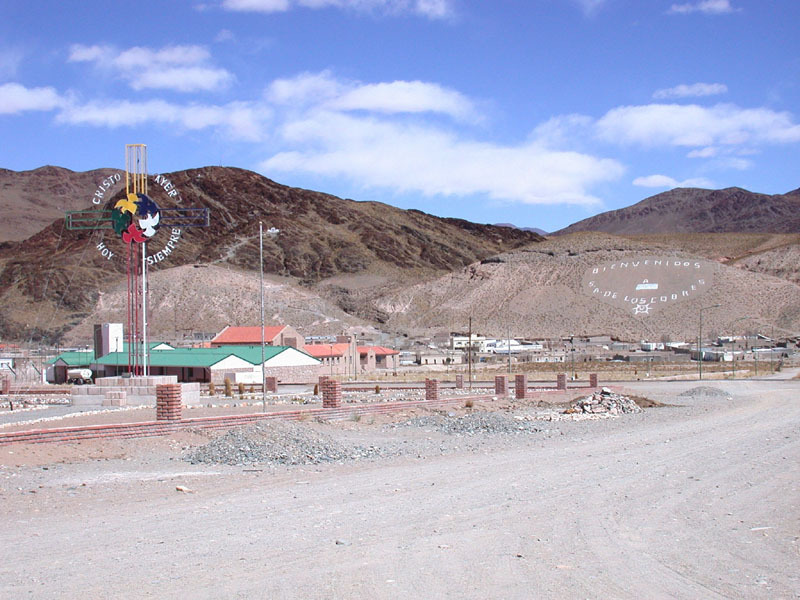 Santa Rosa - a way to the former Indian village. 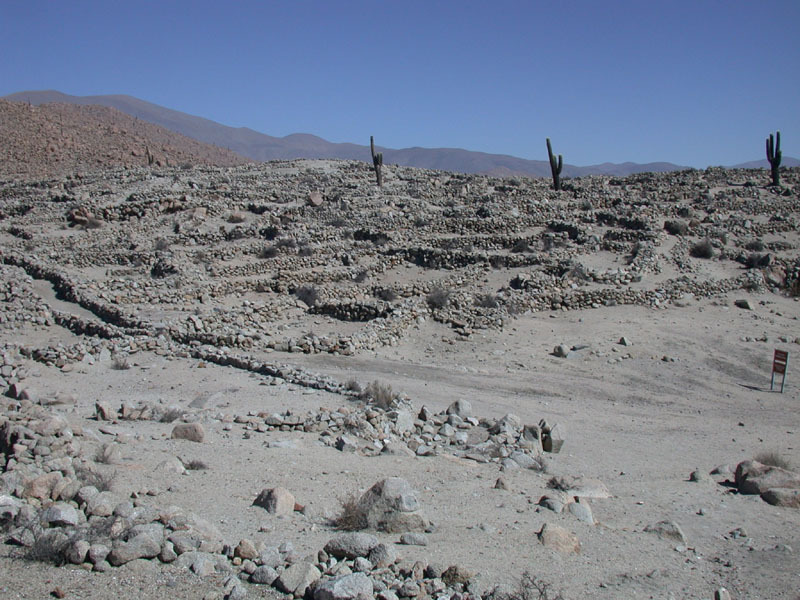 Santa Rosa - ruins of the former Indian village. 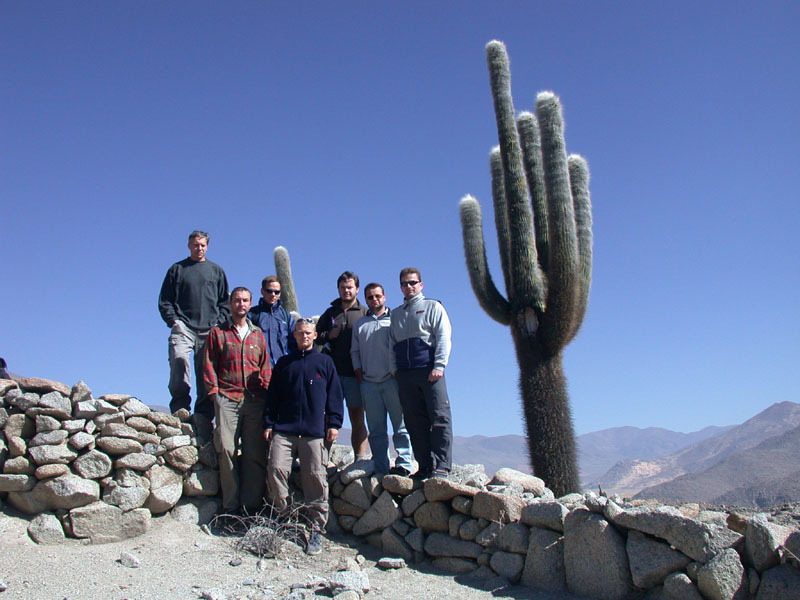 Santa Rosa - our expedition in front of the ruins. 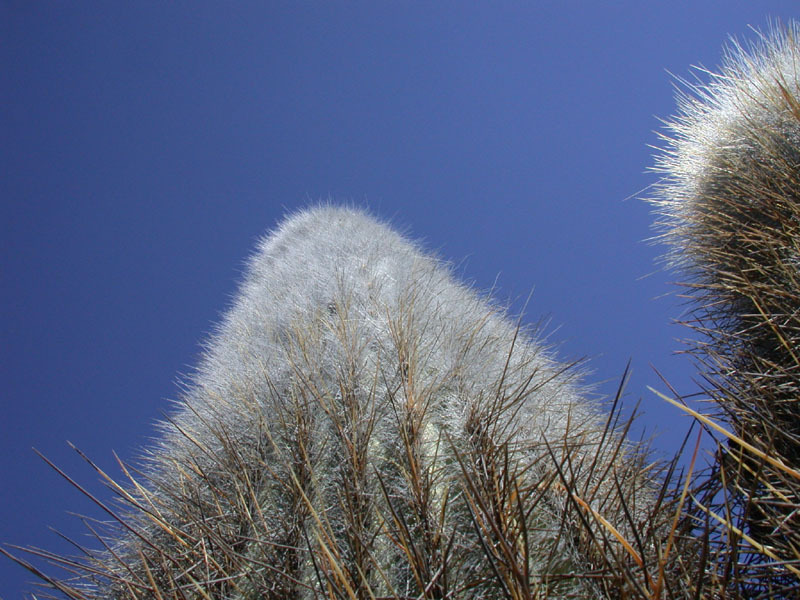 Santa Rosa - a cactus detail. 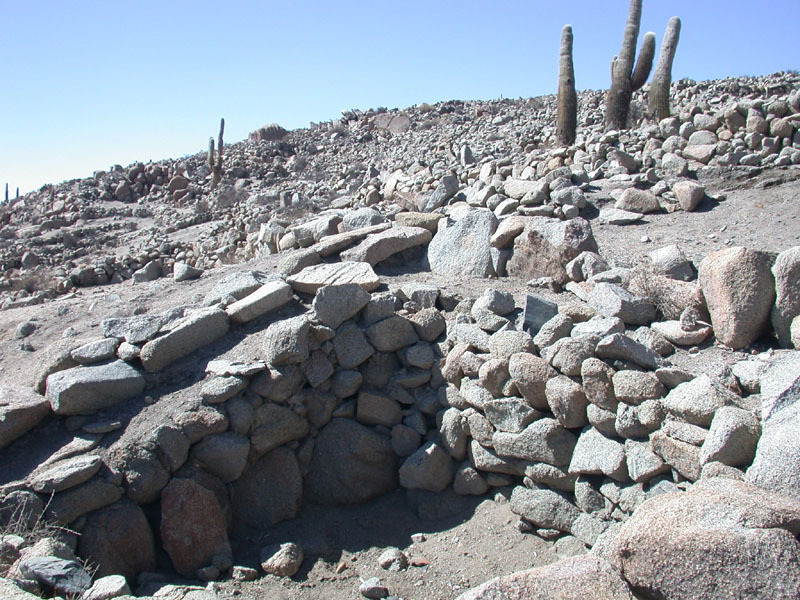 Santa Rosa - ruins of the former Indian village. In the sixth century lived over two thousand people here. 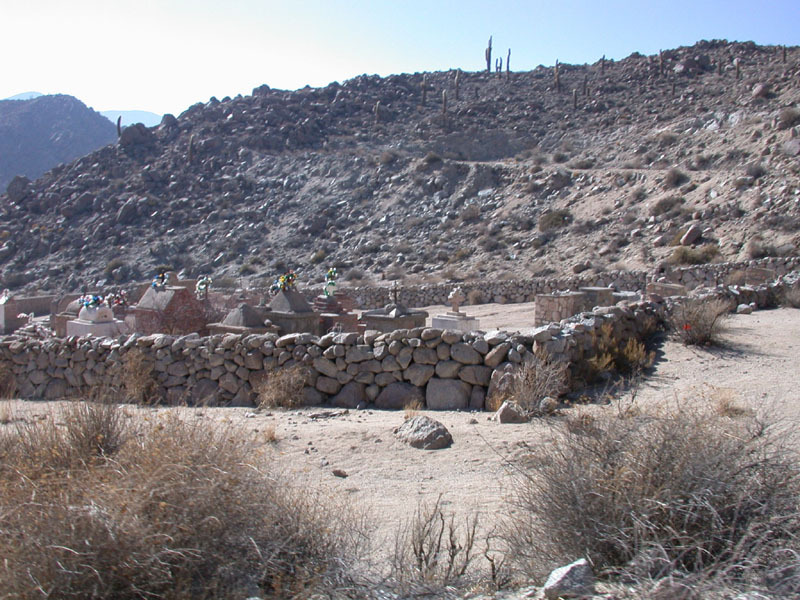 Santa Rosa - ruins of the former Indian village. And the way continues ... San Antonio de los Cobres - a pictorial town in which we had the lunch. It is a pity we have no photographs of the town. 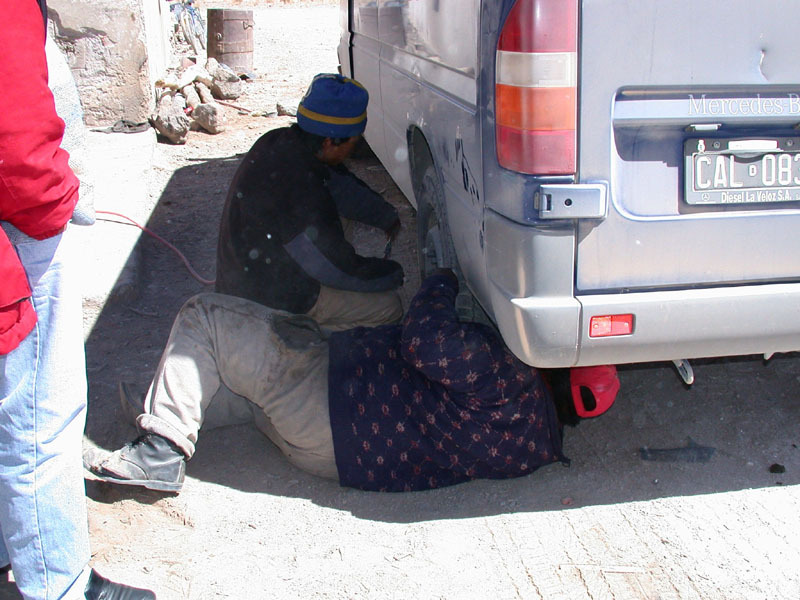 San Antonio de los Cobres - repair of our tire. San Antonio de los Cobres - the only one photo which Paul did in the town. 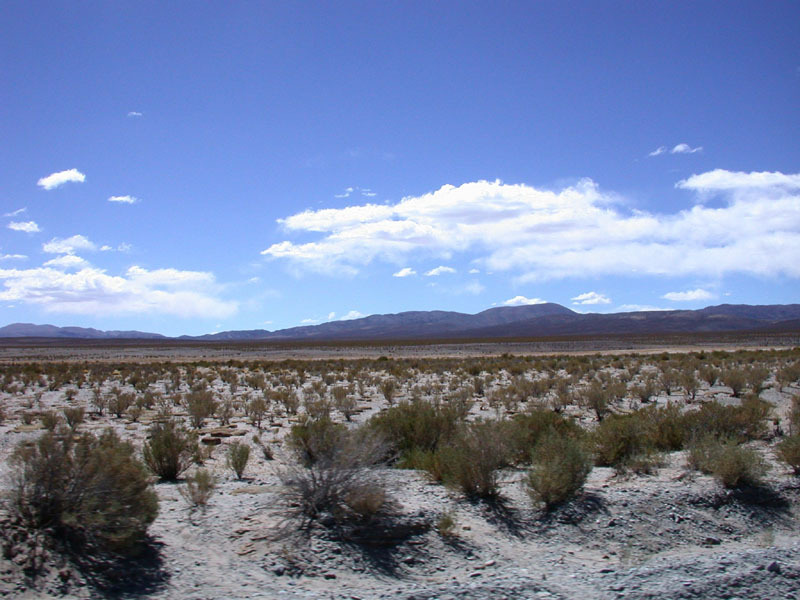 Salt plain Salina Grande near the horizon. 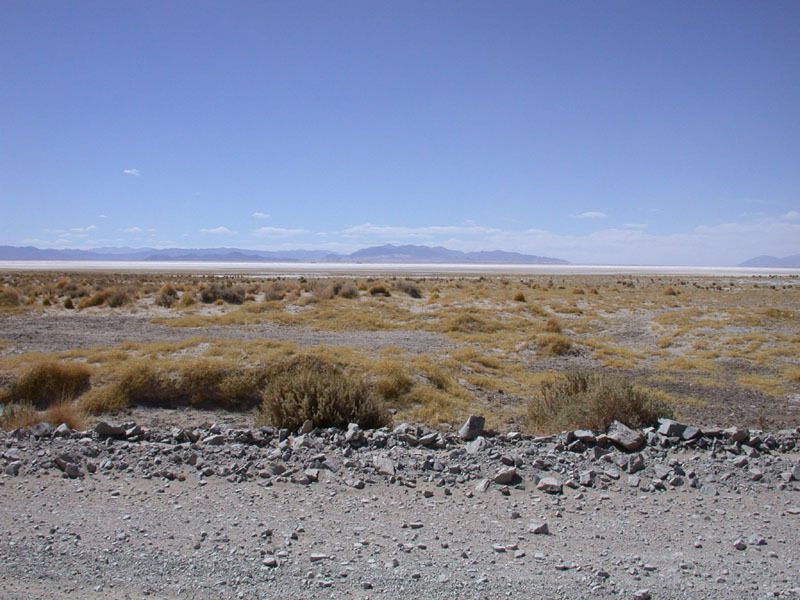 The length of the plain is over 90 kilometers. 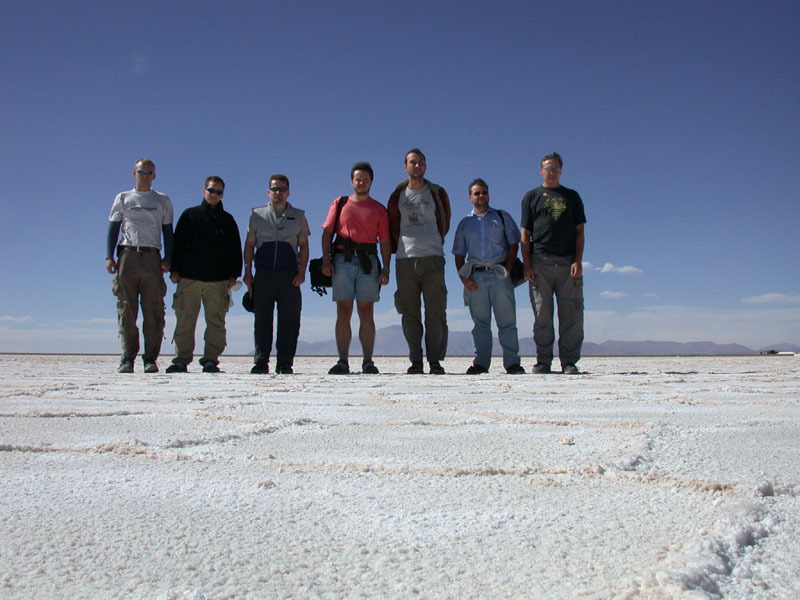 Aldebaran Group for Astrophysics on the salt plain. 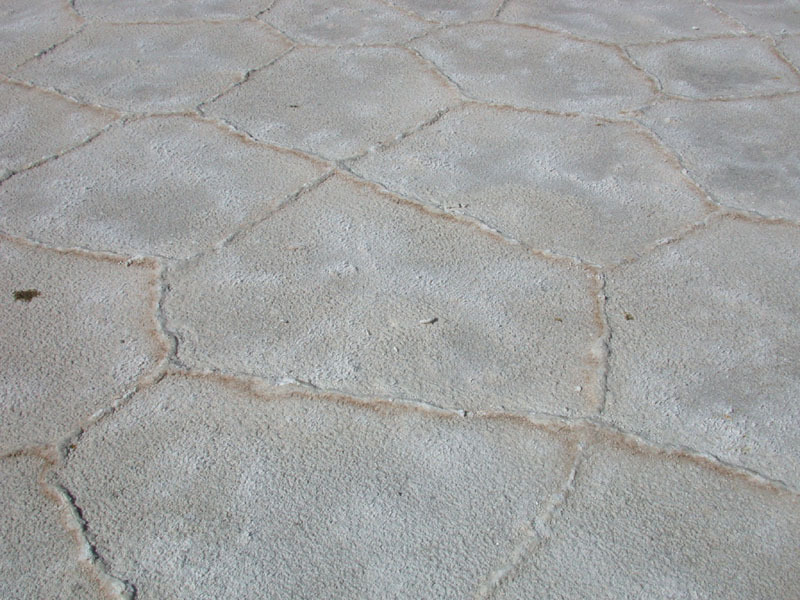 Detail of the Salina Grande surface. 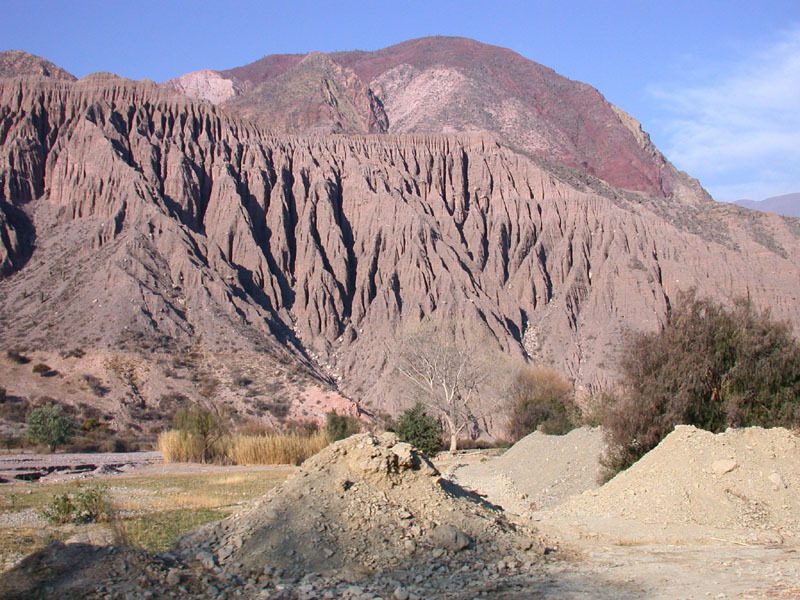 Detail of the Salina Grande surface. 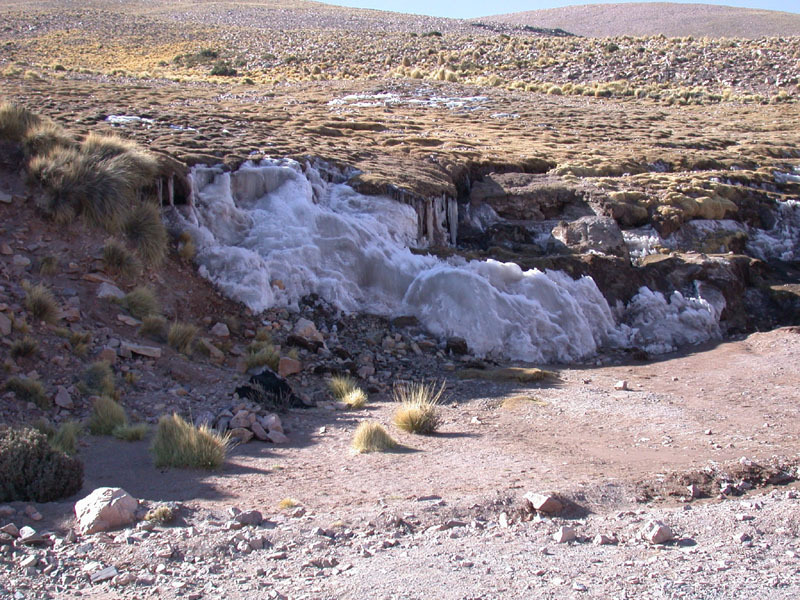 Salina Grande - extraction of the salt. 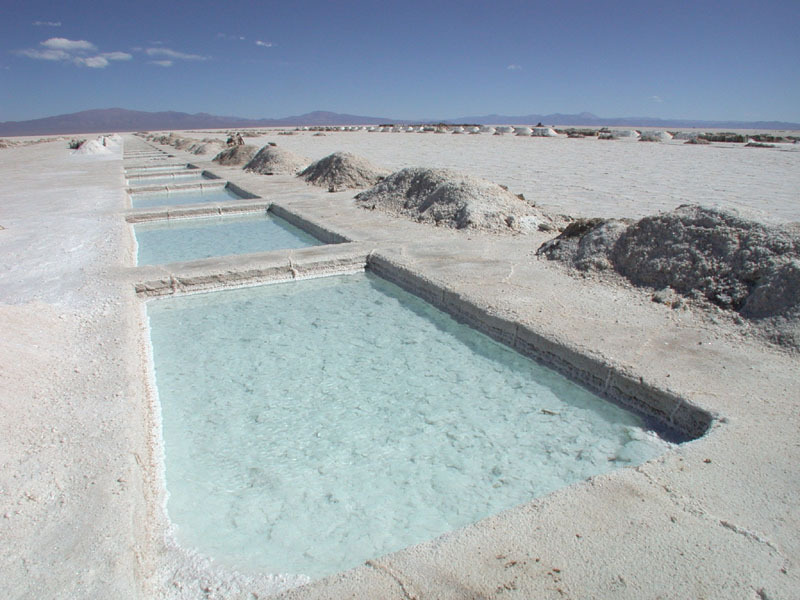 Salina Grande - extraction of the salt. John tastes the resulting product. 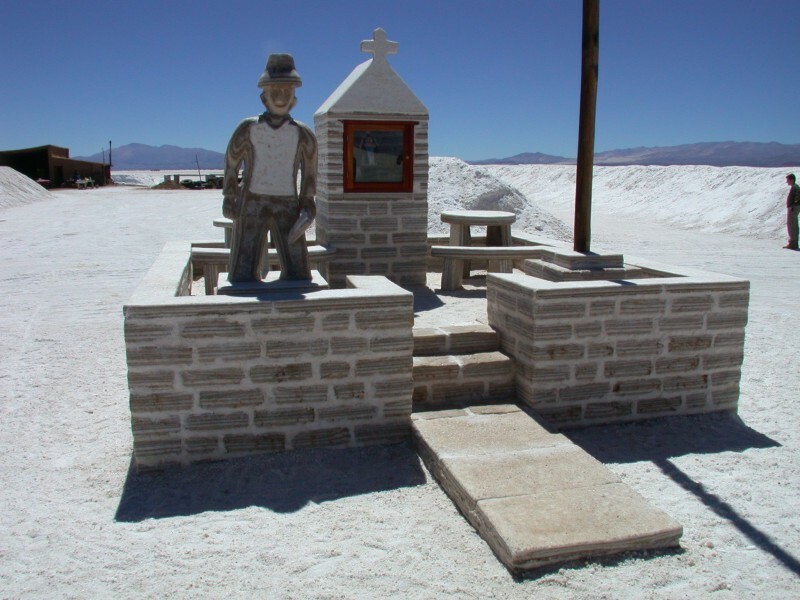 Salina Grande - knocker statue from the salt. 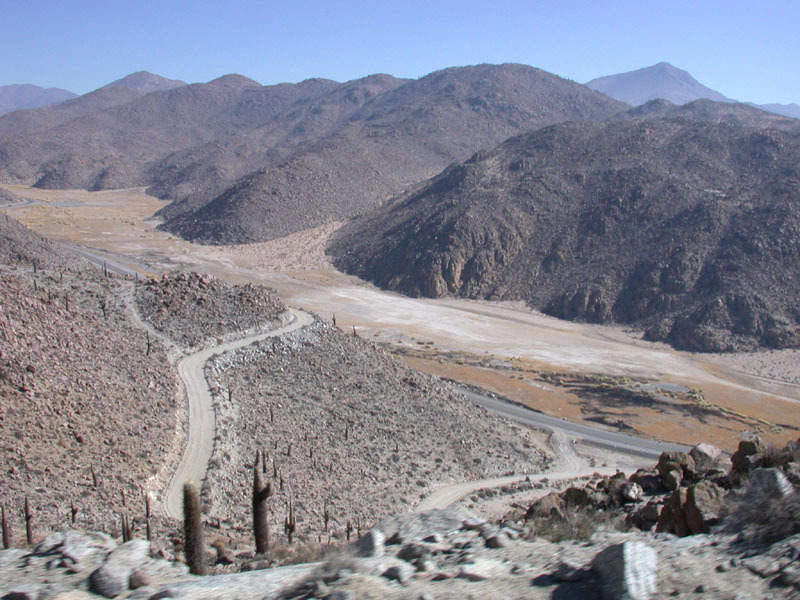 A road meanders in the mountains. 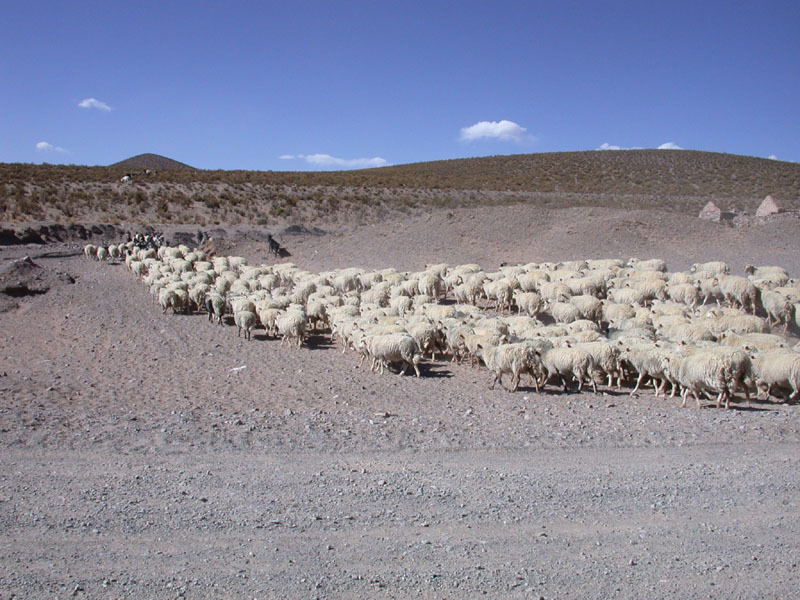 A sheep's flock over the road. 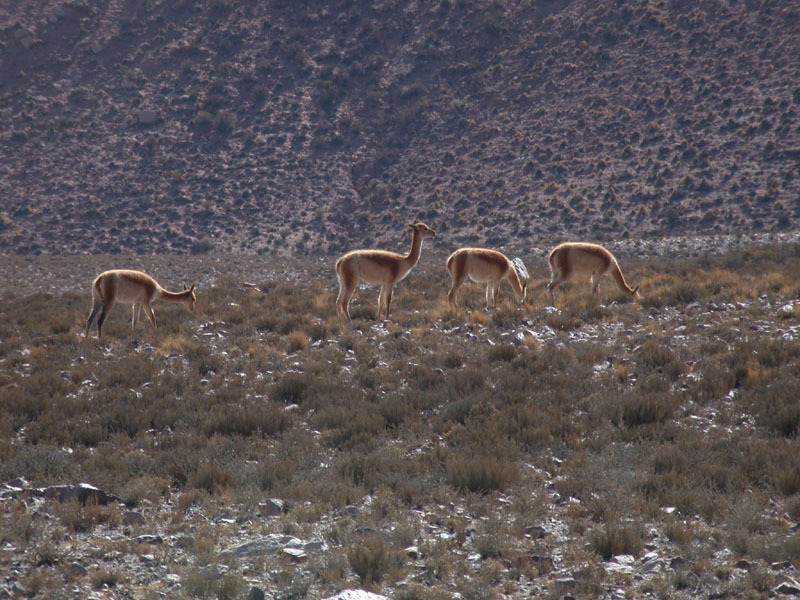 Lamas in wide open space. Later we saw them domesticated. 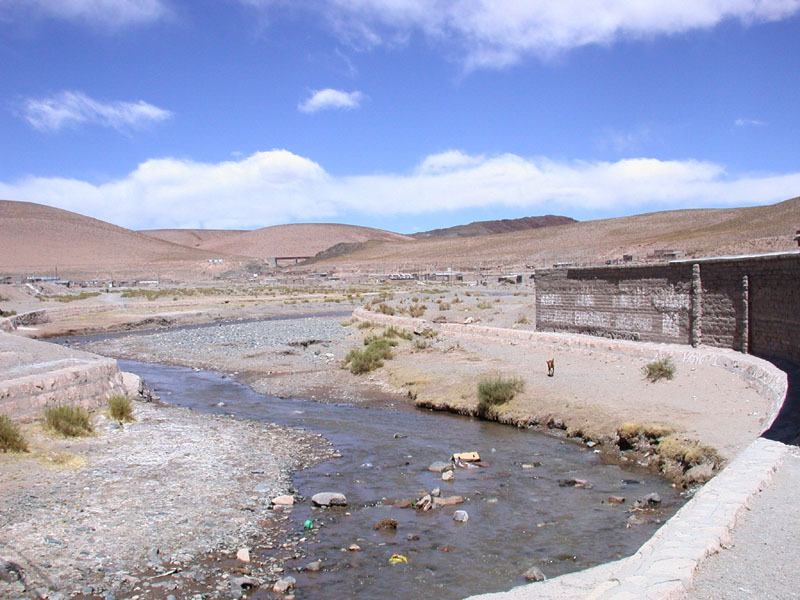 The indigenes manufacture cloth from the lamas' wool. High in the mountains there was a rest of snow. 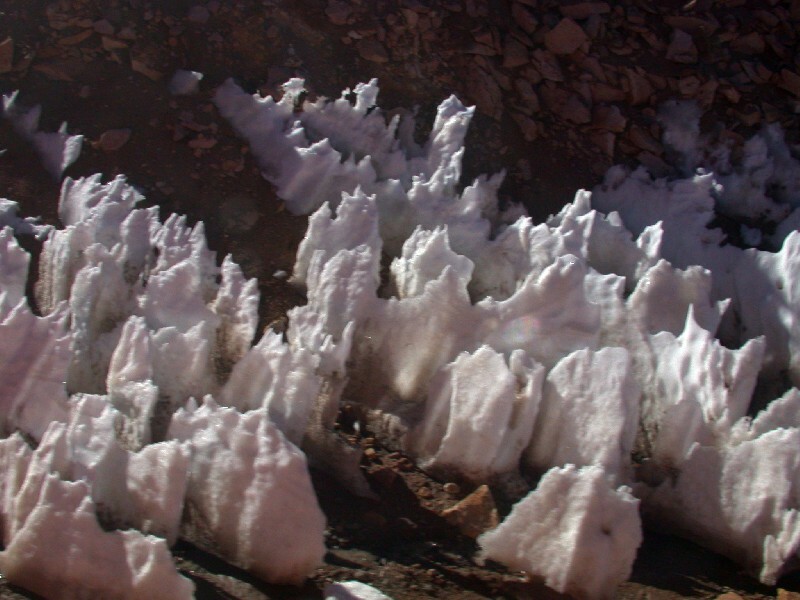 The rest of snow in the Andes mountains at the end of winter. Rock shapes - organ. From the way back. The erosion forms beautiful shapes. 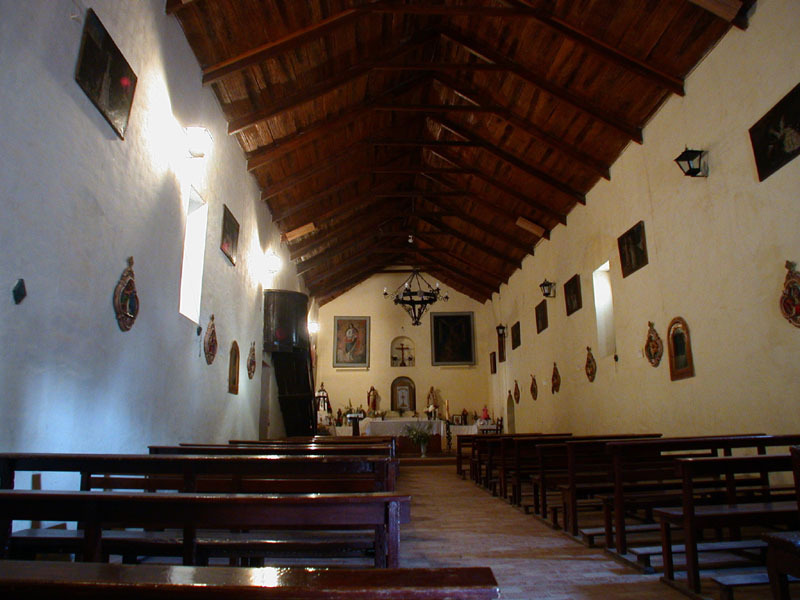 Purmamarca - a church with the ceiling made from the cactus wood. 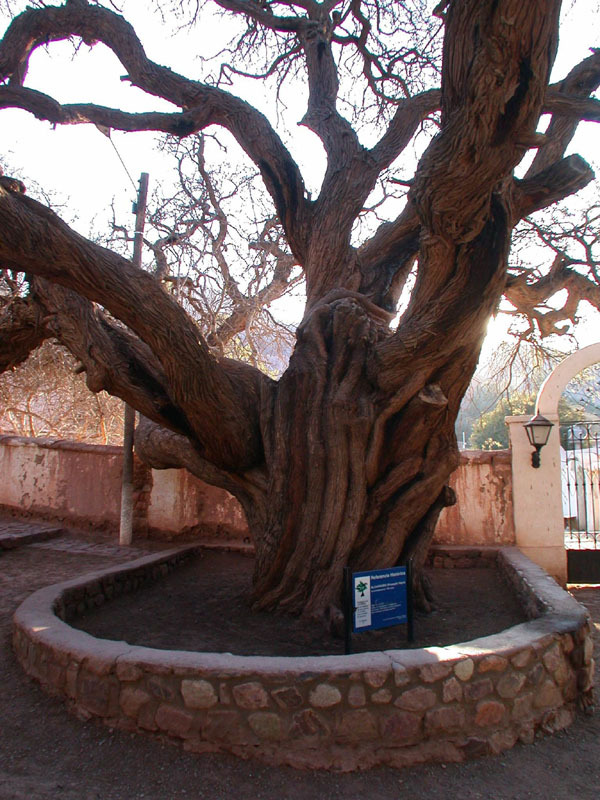 Purmamarca - one thousand years old tree. 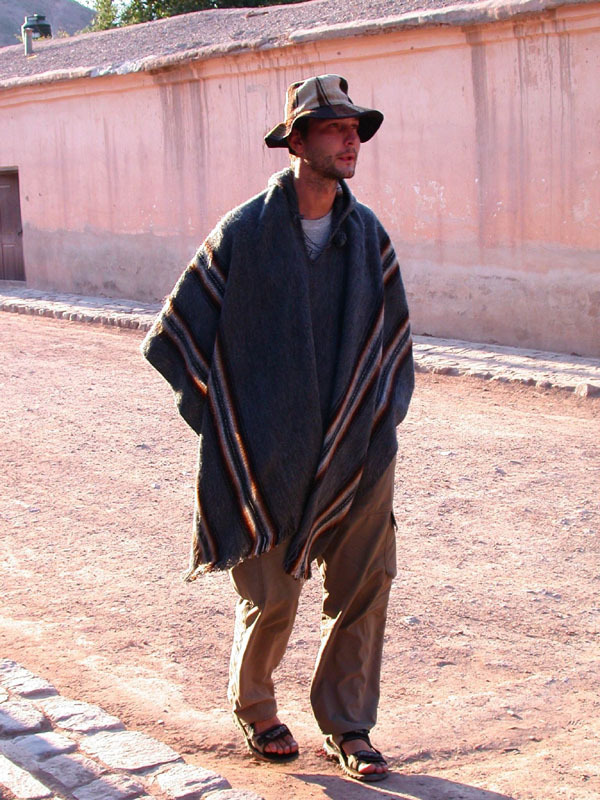 David bought a poncho and a hat in the Purmamarca and began to infiltrate into the native environment.